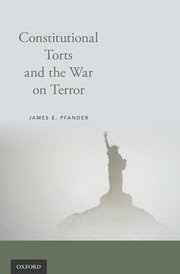 This week and next at Balkinization we are featuring a symposium on James Pfander's new book, Constitutional Torts and the War on Terror (Oxford University Press, 2017). We'll have contributions from Alexander Reinert (Cardozo), Gregory Sisk (St. Thomas), Joanna Schwartz (UCLA), William Baude (University of Chicago), and Stephen Vladeck (Texas). At the conclusion, Jim will respond to the essays.